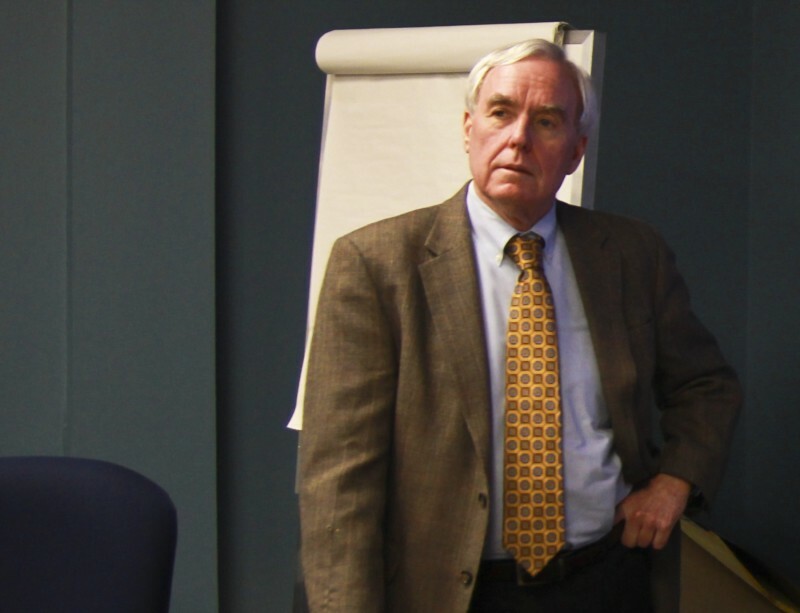 Walsh, left, points out information on the Electronic Valley website to John Joy, right, in Walsh’s Shelton office recently. The two have hosted the Electronic Valley website since 1996. Jack Walsh, at the Valley United Way headquarters in Shelton, where he works. For almost two decades, a group of volunteers has hosted an online encyclopedia of information about the lower Naugatuck Valley — a website that helps people find information on everything from their elected officials to area church services. The most active of those volunteers, Jack Walsh, posts daily updates on the Electronic Valley that include history quizzes, news alerts and links to important community websites. But as part of his efforts, Walsh has been doing the job of the city of Derby too, posting some 57,000 photos, videos and official documents outlining government activity in the city. Now, Derby plans to launch its own website, allowing Walsh to dial down his efforts. The degree to which he’ll step back, though, depends on what Derby ends up posting on its site. His concern: That people in Derby have easy access to government information from home. Derby Mayor Anita Dugatto said the new city website is still in testing mode, and wouldn’t give an estimate for when the site will go live. She hopes Walsh continues to post community information to the Electronic Valley even after Derby gets its site running. Think back to Internet use in 1995. For a refresher, click play on the video. This was pre-search engine, pre-YouTube. Yahoo was a new archive of links. The New York Times hadn’t launched its own website yet. Services like CompuServe allowed people to browse through forums, much like today’s message boards. This was the era Walsh and Oxford resident John Joy, 44, started thinking about more ways to get public information out to the public through what would become the Electronic Valley website. Through their individual efforts to explore the new digital world, they separately came to the same thought: Why can’t we use this technology to keep people more informed about their communities? As they moved forward in their own efforts — Walsh playing around posting information on the Internet as part of his role as president of the Valley United Way and Joy launching an IT and web services company out of his home in Oxford — their paths crossed. It happened in the context of a third effort, Healthy Valley 2000. In the early 1990s, Valley leaders were trying to find ways to improve life for residents of Ansonia, Derby, Shelton, Seymour, Beacon Falls and Oxford as part of the Healthy Valley 2000 initiative. One of the recommendations was increased communication to residents about services and issues in the community, Walsh said. After the region’s daily newspaper and radio station shuttered, leaders were concerned that residents didn’t have access to enough information about their towns. “After a couple discussions, people kept coming back and saying ‘We’re finding lots of great things about the Valley, but nobody knows about it,’” Walsh said. 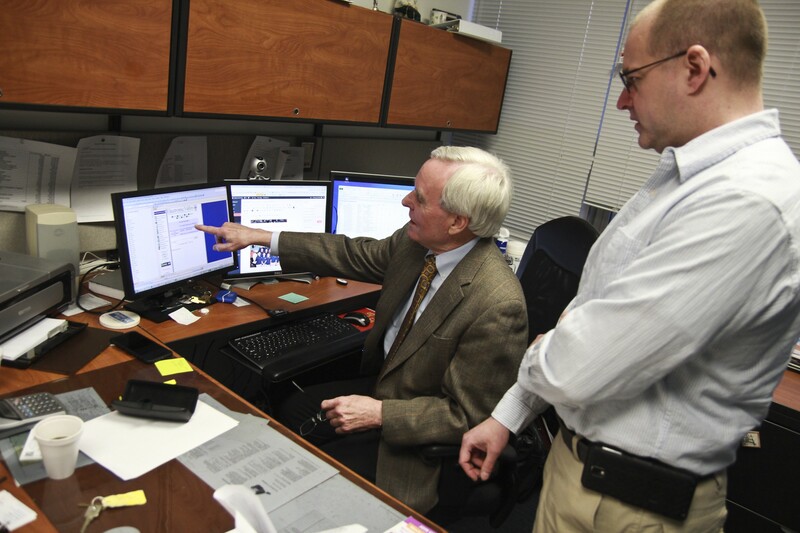 Walsh and Joy formatted the website on one hosted by Virginia Tech, called the Blacksburg Electronic Village. The BEV effort involved connecting as many Blacksburg, Virginia residents to the Internet as possible in the early 1990s. It included a website with community postings. The Electronic Valley committee surveyed people about what information they wanted access to. The answers: education, transportation, health, and government. Walsh and Joy built a landing page for each topic, and for each town in the Naugatuck Valley, linking to any existing sites and providing server space for community postings. One volunteer from each town had access to post on the town page. Walsh took over in Derby. Joy handled the posting in Oxford. Others pitched in updating information for Seymour, Shelton, Ansonia and Beacon Falls. An example of one of the many videos Walsh and Joy hosted on the Electronic Valley in the pre-YouTube days. The low quality was due in part to lower bandwith available in 2001. Video by Jack Walsh. Joy and Walsh were ahead of their time regarding how they posted information as well. Years before YouTube made streaming videos commonplace, for example, the Electronic Valley was publishing streaming videos through RealServer, an early video streaming service, they said. The last hold out, though, is the city of Derby. 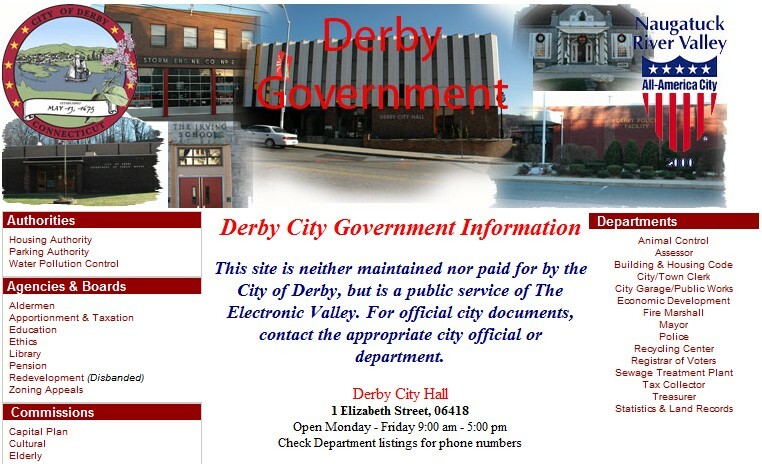 The Derby government section of the Electronic Valley website includes this disclaimer. In the early 2000s, many cities and towns started hosting their own websites. As each town in the Naugatuck Valley took over its own online presence, Walsh and Joy would link to their page from the Electronic Valley website. But Derby’s website remains under the auspices of the Electronic Valley. Walsh and Joy said they keep the governmental material in its own section and have never allowed interference in what the Electronic Valley wanted to post. For starters, Walsh said, having the departments that create the minutes and agendas post the materials is more efficient than having an outside volunteer like himself try to gather the materials each week. One of Dugatto’s campaign promises in 2013 was to bring Derby’s content onto a city-run website. 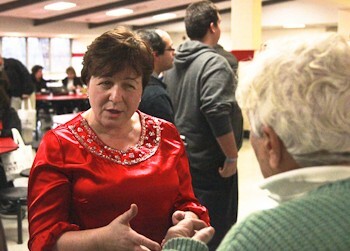 Dugatto at her State of the City address in December, where she publicly thanked Walsh for his volunteer work running the Derby website. More than a year later, Dugatto admitted it has taken longer than she expected. First, she realized city hall would need technology updates. After the city brought in Flagship Networks Inc. to upgrade the computers and system in city hall, Dugatto said she turned her focus to website content. There Dugatto came upon another issue: The city lacked an organizational chart, she said. She wanted to have a clear organization before moving forward. Now the question is: who will be responsible for posting new content to the web? Dugatto said she is leaning toward having each department post its own content. She’d like to have all meeting minutes, agendas and even supporting documents accessible online for the public. Residents who want to see the draft website can visit Dugatto during her office hours Thursdays from 5 to 7 p.m., she said. The site will eventually be live at www.derbyct.gov, but Dugatto wouldn't say when. “We want to be right, rather then to be on time,” Dugatto said. As Walsh and Joy wait, they are thinking ahead to what the Electronic Valley will look like after the transition. Walsh said he’ll keep all the information live, as an archive of the last 20 years in the Valley. Joy hopes to start posting political debates — digital, text-based debates — during election season. They’re proud of the role they played informing the Valley. “You need to be informed in order to make decisions,” Joy said. This article is part of a series designed to highlight average citizens using public information laws in various ways. The content is available free for media outlets to use under a Creative Commons license. Please credit Jodie Mozdzer Gil for text and photos (unless otherwise credited) and link back to this page as attribution. Resources for filing your own Freedom of Information requests can be found here. Jodie Mozdzer Gil is an assistant professor of journalism at Southern Connecticut State University. You can follow her on Twitter @mozactly. 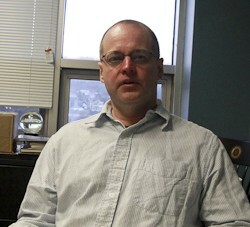 Assistant professor of multimedia journalism at SCSU. @CTSPJ Past President. Former reporter for the @ValleyIndy, Hartford Courant and Republican-American. A series of stories about citizens getting and sharing public information.